Omnichannel and progressive solutions for enterprise, featuring case studies from Fairfax Media and TechCrunch. In 2016, we released Talking to 25% of the web: an in-depth report and analysis on the REST API, following the launch of the recently merged REST API into WordPress core. 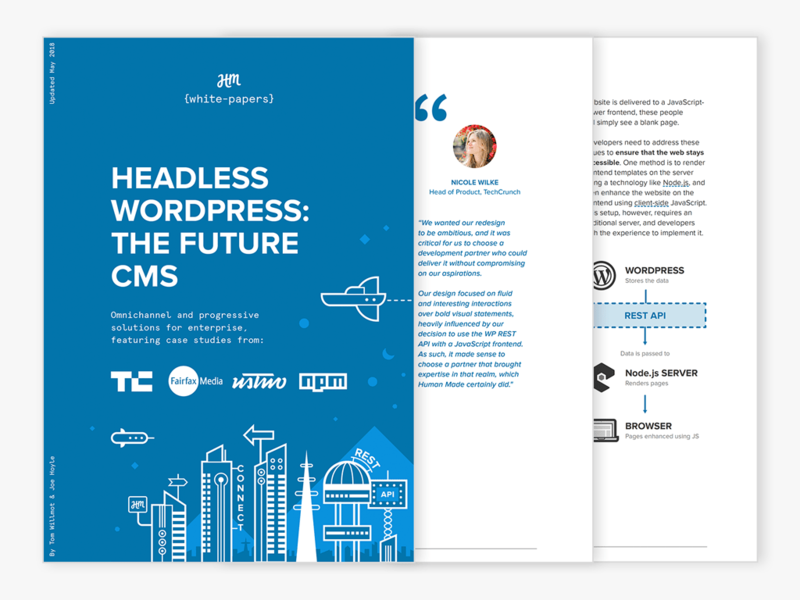 Today, we’re talking to over 30% of the web with our re-released and extensively researched white paper, Headless WordPress: The Future CMS. With the REST API, WordPress stops being a web development tool used in isolation. It is one module that is available in a web developer’s toolkit; a building block to be used in many kinds of applications. We’re deeply involved in the WordPress REST API project. We’ve hosted leading events to teach agencies, publishers, and engineers how to use and build with the REST API; A Day of REST in London and Boston, and a week-long Developer Bootcamp, A Week of REST, in 2017. Our engineers have been at the forefront of the technology, and have led the teams working to build, improve, and advance the REST API. Our experience with the REST API has led us to work with some of the world’s best known publishers. The re-released Headless WordPress: The Future CMS includes one of the most valuable additions to the updated report: the REST API being used in action. Here is a taster of the case studies you can expect to see in our re-released report. TechCrunch adopted WordPress and the REST API to help them decentralise their publishing experience: ensuring they could keep the editorial simplicity inherent with a WordPress backend, whilst making use of the REST API to create a user friendly frontend. Fairfax Media wanted a technology partner to support them through their latest digital evolution: building a custom CMS based on headless WordPress, with a modern publishing workflow, and an audience facing React.js based frontend. The REST API was instrumental in this process; enabling us to update, streamline, and improve their editor screen, and helping us build a modern newsroom experience.